Welcome to Goatland, where goats rule and surf. Their nemesis, the troll, is busy playing on his Xbox. The frogs are intent on following their meditation routine. Trip Trap Troll is a video slot by AdoptIt Publishing based on the fairytale of three (hilly)billy goats trying to cross a bridge without ending up as the troll’s lunch, with this game’s 3D graphics giving more than a nod to the Shrek cartoon series. But the game has more to offer than just great graphics; there’s a well-stocked array of bonus features, including the Crashing Cages feature, Wilds, Extra Wilds, and a Free Spins round where you get to build a bathtub for the goats (yeah, don’t ask). Time to look a bit more closely at this day out on the prairies with the three goats and their bridge-crossing feat – so join us as we find out more about the game’s features. Trip Trap Troll comes with a relatively high RTP of up to 97.27%, with a minimum bet of € 0.25 while the maximum bet is of € 100. The game features 5 reels, 3 rows and 25 winning paylines. In Trip Trap Troll you’ll come across the Crashing Cages bonus, where any symbol forming part of a winning combination will be destroyed and the symbols forming it will leave blank spots on the reels. The blank spaces will be filled by other symbols falling from above the reels, and can potentially earn you a further win, or two, or three, depending on your luck. In fact there is no maximum limit to how many cascading wins you can score – keep in mind these extra wins will not cost you anything other than the wager you placed on your first spin. But this is not all. Once you score 2 Crashing Cages wins in a row, the small goat will turn into an extra Wild symbol, allowing you to score even further wins as part of the same sequence. If you land 4 consecutive wins, the surfer goat will also turn wild and if you’re lucky enough, you will score 6 consecutive wins and another goat will turn into a Wild, making it easier to continue the sequence. The Troll on his Xbox is a Scatter symbol, and when he lands at least three times on the reels you will receive a payout of 3x the total bet as well as 10 Free Spins. During the Free Spins, a log fire symbol can appear on reel 5, and once you collect 3 fire symbols, you will start building the hot tub for the medium goat, with another 2 extra spins added to your lot. If you land six fire symbols, the big goat will get a hot a tub and all your wins will then be subjected to a 2x multiplier. Now that we’ve tested it again, we’re not totally sure if it’s a relaxing hot tub or something that looks like a cauldron, and we have a lingering suspicion that no good can come of this. If you’re a goat, of course. The lower paying symbols on the reels of Trip Trap Troll include the 10, J, Q, K and A cards, and pay out a maximum of 150 coins for five of a kind, but you will also get payouts for as little as three hits on a payline. Generally, these symbols will help you boost your balance since you get to land them more frequently than others. The goat symbols offer higher payouts. The baby goat has a maximum payout of 175 coins, the cool goat comes with a 225 coin payout, the surfer goat stands at a maximum of 250 coins while the skateboarder pays out a maximum of 300 coins for five identical symbols. In the regular mode, the highest paying symbol is the frog with a whopping maximum of 1000 coins for landing 5 times on a winning payline. The Frog, in spite of his meditations, is also the Wild symbol and replaces any other card or goat if he lands in the right place to complete a combination. Trip Trap Troll comes with excellent 3D graphics and plenty of animations that make this a fun video slot indeed. Top marks for AdoptIt Publishing, who have created an incredibly likeable game with cartoonish graphics, an overall clean layout and a relaxing background scenery. It looks good and there’s a great gameplay to go with it – as well as plenty of winning opportunities with the Crashing Cages and Free Spins features, peppered with multipliers. 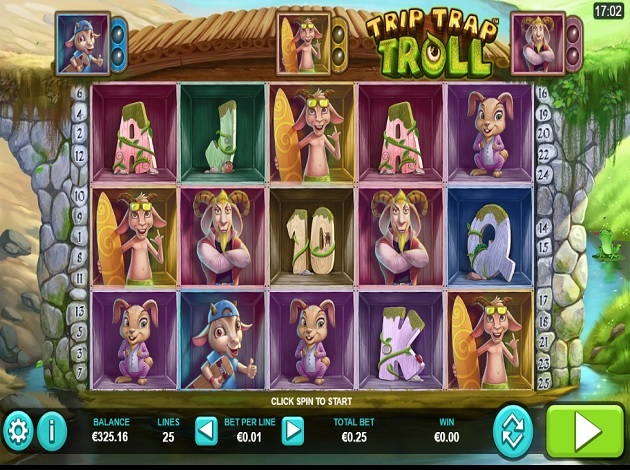 Enjoy Trip Trap Troll, a great video slot produced by AdoptIt Publishing! With over 20 years of combined experience in the industry, AdoptIt Publishing is set to keep growing at a steady pace and looking at their games so far, they’re definitely set to become a major gaming provider. Some of AdoptIt Publishing most popular slots so far include Geisha’s Garden, Reel Angels, and Snow Wild and the Seven Dwarfs.